The DGA Blowfly I - Signature Line is a putter and approach disc that is straight to slightly overstable. The Blowfly I has a blunt edge and it wraps its way around a set of chains. It will stick if it hits the ground if you happen to miss your putt or use it for an approach shot/ The Blowfly I is ideal for both beginner and experienced players! The Blowfly I is a reliable putt and approach disc, has extreme grip, flips to flat (flattens out as if flies) and floats on water. It belongs to DGA's Signature Line of discs which were created by "Steady" Ed Headrick. The unique plastics are incredibly durable. They bounce off hard objects and grab the chains while absorbing any chain shock. Due to their cool grip and looks, they have become favorites! No other putter is like it. The Signature Line discs can be found in the hands of disc golf pros but their rubbery consistency makes them an excellent choice for beginners. Great for playground us as the soft rubbery plastics will prevent injuries that kids can get from a harder plastic golf disc. 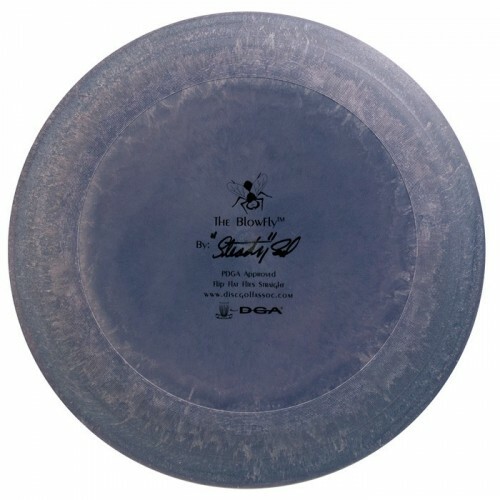 Signature Line discs are made from “Steady” Ed’s secret formula and were his go-to putters in Ed’s disc throwing days. The Signature Line plastic is extremely flexible and durable. You can literally taco these discs and they will expand right back to original shape.